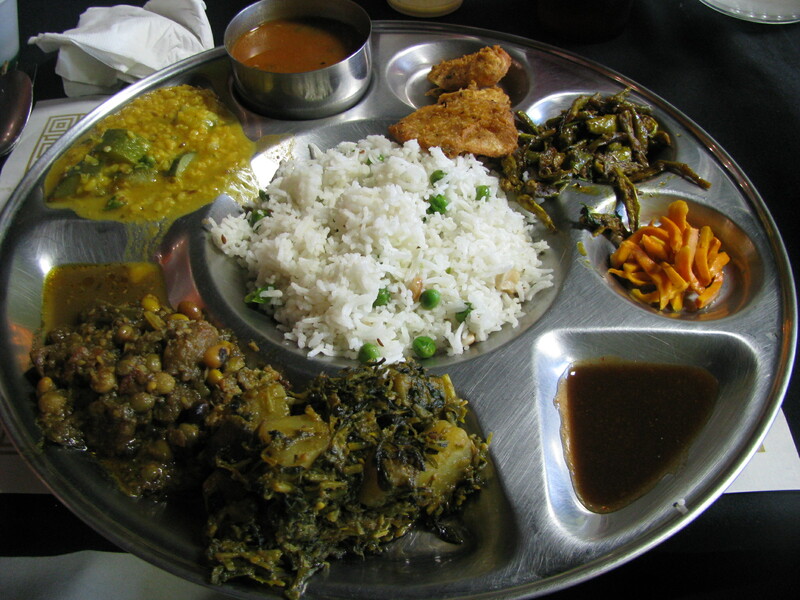 Banana Leaf is a vegetarian and vegan Indian restaurant whose owners hail from Gujarat in western India. 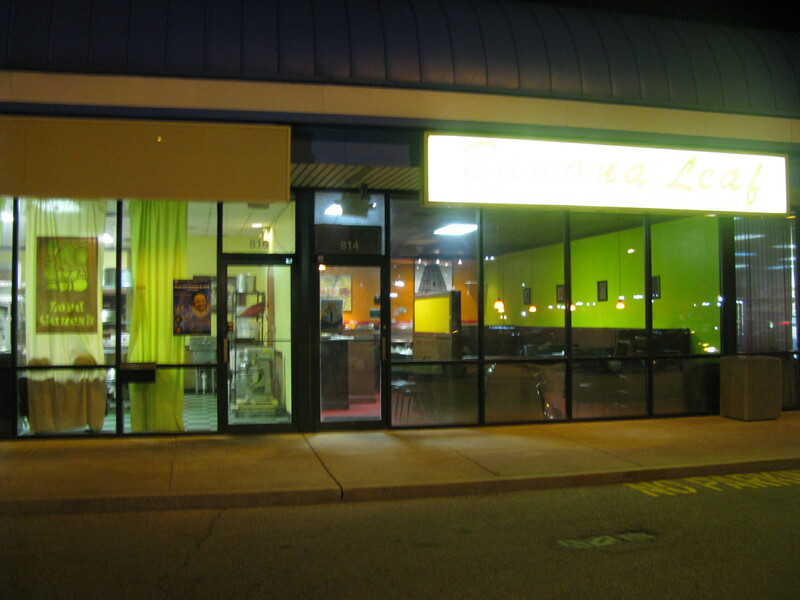 Banana Leaf has several features that distinguish it from other Indian restaurants. Although you can order a la carte, most people opt for the grand buffet option, available both at lunch (11.30-2.30pm) and dinner (6-9.30pm). 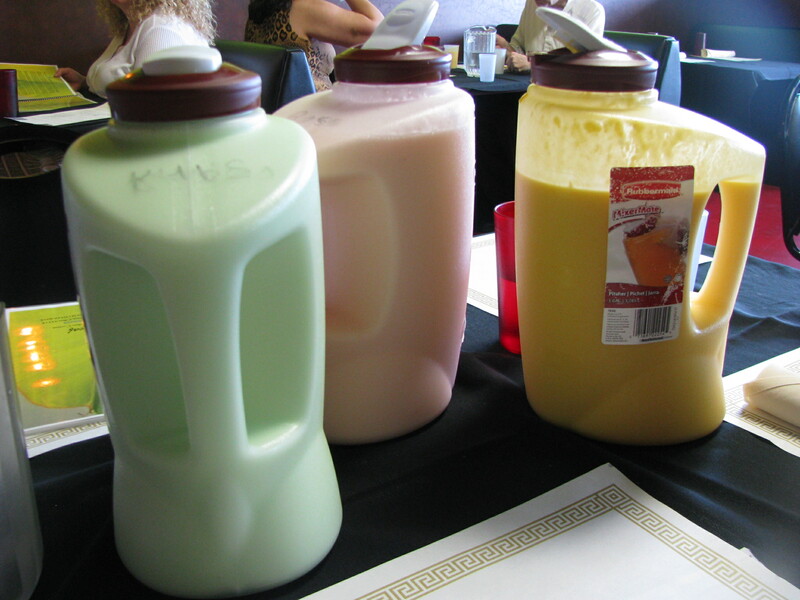 On arrival you are greeted with endless lassi (a rich yogurt ‘smoothie’), which comes in a choice of 6 flavors (mango, rose, khus, sweet or salted). Khus is a bright green herbal syrup with a woodsy medicinal flavor. The second distinctive feature are the chaats, prepared in the dining room. 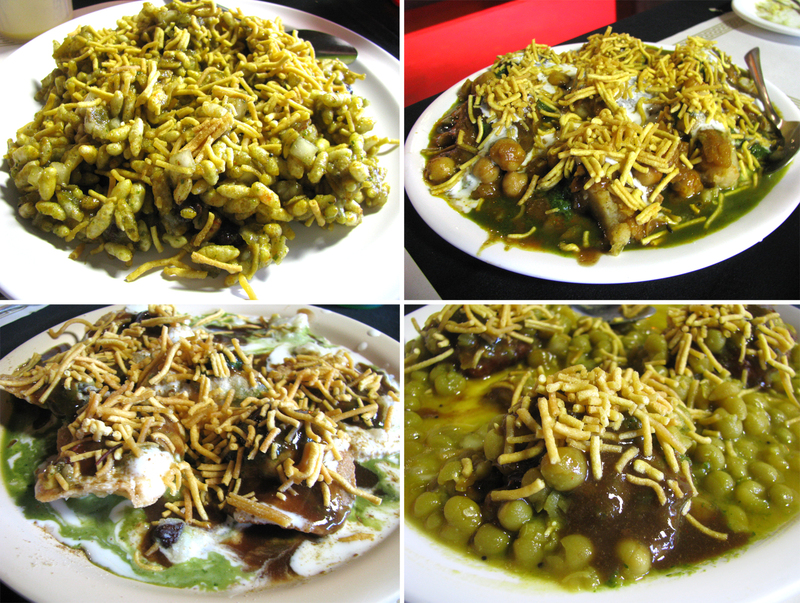 Chaats are traditionally a street food in western India, originating in Gujarat. These were described as the second course but arrived as a series of separate plates served family style, giving the opportunity to savor each one individually. I won’t describe them all in detail, but they were intriguing mixes of flavor and texture with spicy, crunchy and cooling chutney: they included bhel puri – puffed rice krispies mixed in a tangy and sweet sauce with onions, potatoes, tomatoes and cilantro; ragada pattis – spicy potato patties simmered and seasoned with dried pea spicy gravy; samosa chaat – samosas covered with spicy chickpea gravy. Also served at the table were masala dosas, thin rice crepes stuffed with a spiced potato mixture. 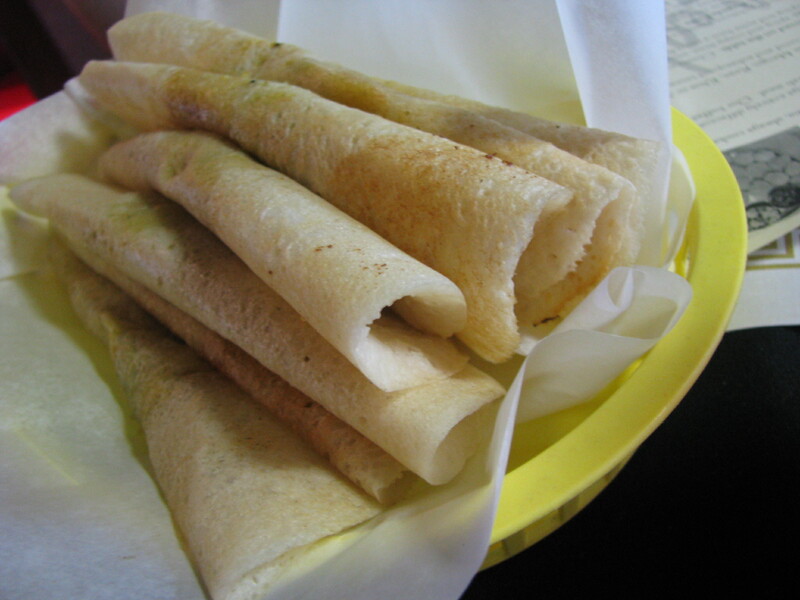 Piled together, they got a little soggy and didn’t quite live up to the versions found at Dosa Corner or Udipi. 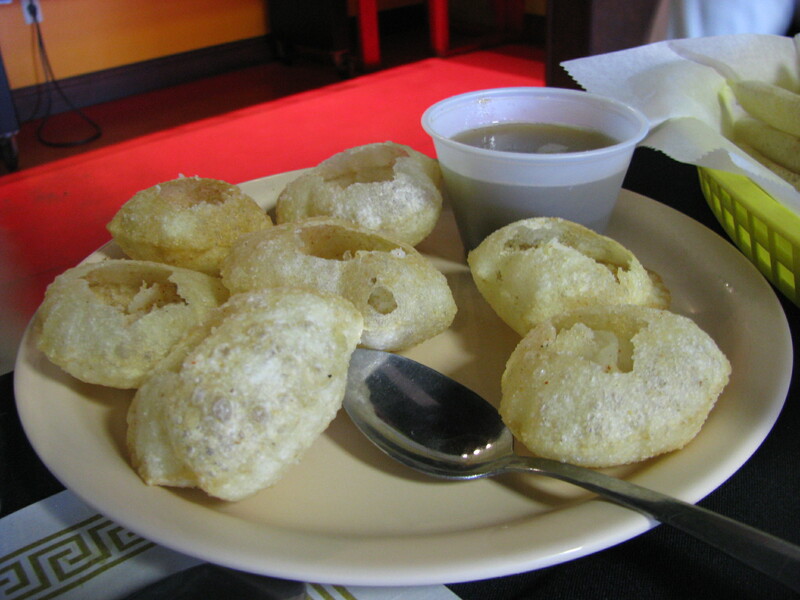 The pani puri were a notable hit, small round crunchy puffs into which you pour a spicy broth before eating. You would be correct in thinking that this is already a lot of food, especially given the set price of $12.95 but the buffet component of the meal is still to come. The buffet consists of choices of an appetizer (potato pakora), vegetable curries, daals, steamed rice, special rice, chutneys, vada (a lentil flour donut) and a dessert (halwa). The buffet changes daily and is different even from lunch to dinner on the same day. Just when you think you can’t eat or drink anything more, its time for masala chai, milky tea served (we suspect for western tastes) unsweetened. We were there at closing time and were offered any leftovers that we wanted to take home from the buffet. The owner Kamal Panchal and his wife are extremely friendly and passionate about their food. They enthusiastically explained the dishes to us and patiently answered all our questions, even bringing some khus syrup to the table for us to taste. Kamal is an animated and entertaining story teller. Banana Leaf is very good value and a great introduction to southern and western Indian food. There is more information about the a la carte menu and buffet options on Banana Leaf’s website as well as a $1 off coupon valid until the end of the year. This entry was posted in Indian, Restaurant, vegetarian and tagged buffet, chaat, dosa, halwa, lassi, thaali. Bookmark the permalink. Just wanted to say Thank You for the tip on this! I took a vegetarian friend there last night for her birthday dinner and it was a fantastic meal. Visited 5/1 for dinner; all I can say is YUM! We were full before the last appetizer. Owner is so helpful (explained everything and gracious w/questions). Definitely there’s a return visit in the near future for us! if you like food drenched in oil this is the place to go. the buffet is the most expensive of the Indian restaurants and the quality is mediocre. if your purpose is to eat until you burst this might be your cup of chai.